As depicted in the art and petroglyphs of the Aboriginal people, UFO and alien sightings go back to ancient times. 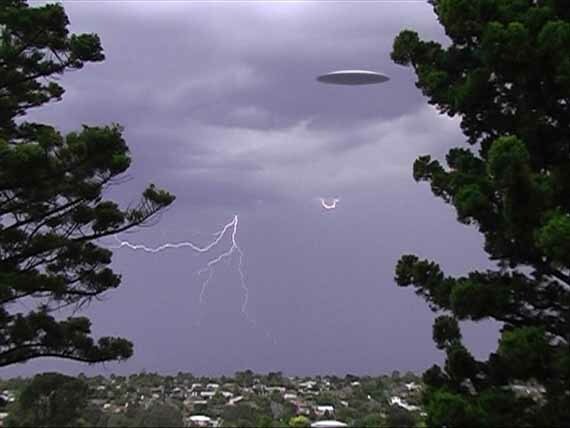 Although there have been UFO sightings all over Australia, some of the most frequent sightings have been in New South Wales, near Katoomba - the chief town of the City of Blue Mountains in New South Wales, Australia. Following global patterns, sightings are more common in specific grid points and ley lines where the magnetics are strongest. Locals in these areas often have sightings that are not reported to the government or the media. There are few indigenous people who have not seen UFOs and consider them part of their legends and ancient mythologies, highlighted in their creation myths. Gods visit in flying spacecraft and create a race called humans. There is always the promise they will return one day. As with the rest of the world, UFO sightings are increasing as if to some final destiny many anticipate. It's all going somewhere ... soon. At approximately 11.00 am on Wednesday, 6 April 1966, a class of students and a teacher from Westall High School (now Westall Secondary College) were just completing sports on the main oval when an object, described as being a grey saucer-shaped craft with a slight purple hue and being about twice the size of a family car, was alleged to have been seen. Witness descriptions were mixed: Andrew Greenwood, a science teacher, told The Dandenong Journal at the time that he saw a silvery-green disc. According to witnesses the object was descending and then crossed and overflew the high school's south-west corner, going in a south-easterly direction, before disappearing from sight as it descended behind a stand of trees and into a paddock at The Grange in front of the Westall State School (primary students). After a short period (approximately 20 minutes) the object - with witnesses now numbering over 200 - then climbed at speed and departed towards the north-west. As the object gained altitude some accounts describe it as having been pursued from the scene by five unidentified aircraft which circled the object. The alleged sighting was investigated by two groups: The Victorian Flying Saucer Research Society (VFSRS) and Phenomena Research Australia (PRA). Both groups described it as being one of Australia's major unexplained UFO cases. The VFSRS team arrived on the site on 8 April and spoke to students and viewed the ground mark. The VFSRS printed an image and a small report in their magazine "Australian UFO Bulletin" in December 2000. An investigator, Brian Boyle (PRA), arrived at the site on 9 April with four army investigators. Boyle did a number of interviews, which he recorded on tape, over a number of days and took samples from the ground mark. These investigators were able to speak to many of the witnesses as it was over the Easter holidays - April 8-11. One of the most famous cases occurred in 1972 on the Bernard Eddelbuttel farm. As Mrs. Eddelbuttel was washing dishes one night she saw an orange light moving above the trees and descending west of the house behind some pig sheds. Thinking the lights came from spotlight hunters who shoot game when it is blinded by light, she called her husband who was in the bathtub to come and investigate. Meanwhile a brother-in-law went to the pig sheds to investigate. What he saw seized him with panic and he ran back to the farmhouse to tell the others. There was a disk-shaped craft hovering amid the trees with a light so bright it lit up the whole area. The blinding light came from a central dome, but there were other lights around it. As he watched, the glow faded rapidly, leaving the craft almost invisible in the darkness among the trees. The family locked and bolted every door and called the police. Meanwhile motorists on a nearby freeway had seen the light and were also calling to report it. At first the police were reluctant to investigate and it took several calls to get them to drive out to the farm. When they arrived, all traces of the UFO were gone. Others also reported seeing the object at close range. In another report in 1973 Jason Bentley sighted a strange object at 8 pm, passing over nearby Kanimbla Valley (not far from Bathurst), heading from east to west. The valley was covered in a layer of mist and the object, which was lit by bright yellow lights reflected off the mist, as it traveled at great speed. Within the next half hour others also reported seeing the UFO. The Valentich disappearance refers to the unexplained disappearance on 21 October 1978 of 20-year-old Frederick Valentich while piloting a Cessna 182L light aircraft over Bass Strait in Australia. He intended to land at King Island to pick up three or four friends and return to Moorabbin Airport. During the 127-mile (235 km) flight, Valentich advised Melbourne air traffic control that he was being accompanied by an aircraft about 1,000 feet (300 m) above him. He described some unusual actions and features of the aircraft, saying that his engine had begun running roughly, and finally reported that the "strange aircraft is hovering on top of me again. It is hovering and it's not an aircraft." Valentich and his aircraft were never found, and an Australian Department of Transport investigation concluded that the reason for the disappearance could not be determined. Belated reports of a UFO sighting in Australia on the night of the disappearance led Ken Williams, a spokesman for the Department of Transport, to tell Associated Press that "it's funny all these people ringing up with UFO reports well after Valentich's disappearance." A pilot with a Class Four instrument rating and 150 hours of flight experience, Valentich filed a flight plan from Moorabbin Airport, Melbourne, to King Island in Bass Strait on 21 October 1978. Visibility was good and winds were light. He was flying a Cessna 182-L, with a cruising speed of around 256 km/h (160 mph). He departed Moorabbin at 18:19 local time, contacted the Melbourne Flight Service Unit to inform them of his presence, and reported reaching Cape Otway at 19:00. At 19:09 Robey asked Valentich to confirm his altitude and that he was unable to identify the aircraft. Valentich confirmed his altitude and began to describe the aircraft, saying that it was "long", but that it was traveling too fast for him to describe it in more detail. Valentich stopped transmitting for about 30 seconds, during which time Robey asked for an estimate of the aircraft's size. Valentich replied that the aircraft was "orbiting" above him and that it had a shiny metal surface and a green light on it. This was followed by 28 seconds silence before Valentich reported that the aircraft had vanished. There was a further 25-second break in communications before Valentich reported that it was now approaching from the southwest. Twenty-nine seconds later, at 19:12:09 Valentich reported that he was experiencing engine problems and was going to proceed to King Island. There was brief silence until he said "it is hovering and it's not an aircraft". This was followed by 17 seconds of unidentified noise, described as being "metallic, scraping sounds", then all contact was lost. A Search and Rescue alert was given at 19:12. Valentich failed to arrive at King Island by 19:33, and a sea and air search was undertaken, and two RAAF P-3 Orion aircraft searched over a seven-day period. Search efforts continued until 25 October 1978. Analysis of a fuel slick found roughly near where Valentich had last radioed Robey proved that it was not aviation fuel, and no trace of the aircraft was found. The aircraft was equipped with four life jackets and an emergency radio beacon, and was designed to stay afloat for several minutes. A two-week long Department of Transport (DOT) investigation into Valentich's disappearance was unable to determine the cause, but that it was "presumed fatal" for Valentich. A report published on 27 April 1982, summarized the radio conversations on the evening of 21 October 1978 between Valentich and Robey. During Valentich's final recorded transmission to the Melbourne Service Unit, seventeen seconds of unexplained noise, described as being "metallic, scraping sounds," were recorded by DOT Air Traffic Control audio tapes. The tape of the conversation ending with this noise was never made public. Only researchers and the parents of Valentich heard the transmission recordings. Researchers Paul Norman and John W. Auchettl received a full copy of the original voice tapes from the DOT and later from the pilot�s father for analysis. Auchettl had a copy analysed by the Royal Melbourne Institute of Technology (RMIT) and another was taken to the United States by Norman for analysis by Dr. Richard F. Haines, a former researcher with NASA-Ames and Associate Professor of Psychology at San Jose State University. Haines described the sounds as "Thirty-six separate bursts with fairly constant start and stop pulses bounding each one," and said that there were "no discernible patterns in time or frequency." The significance of the sounds, if any, has remained undetermined. After news of Valentich's disappearance became public, a number of individuals reported witnessing unusual activity in the area.Some people claimed to have seen "an erratically moving green light in the sky" and in one instance witnesses, located about 2 km west of Apollo Bay, Victoria, stated that they saw a green light trailing or shadowing Valentich's plane, and that he was in a steep dive at the time. Ufologists said these accounts were significant as most were recorded several years prior to the 1982 release of transcripts in which Valentich had described the object above him as having a green light. According to an Associated Press report, Guido Valentich, the father of the missing pilot, said "he hoped his son had been taken by a UFO and had not crashed. 'The fact that they have found no trace of him presents a possibility that UFOs could have been there. '"; Guido Valentich also told the AP that "his son used to study UFOs as a hobby using information he had obtained from the air force. He was not the kind of person who would make up stories. Everything had to be very correct and positive for him.'" Unconventional explanations for Valentich's disappearance include speculation by ufologists that the unexplained aircraft with the green light that he reported was an extraterrestrial vehicle, which in turn either abducted Valentich or caused the destruction of his plane in some fashion. Speculation that a UFO was involved has been fueled by a number of factors, including Valentich's last transmission, in which he described the aircraft shadowing him as hovering and not an aircraft, the unexplained sounds that were heard at the end of his transmission, and a rash of UFO reports from the area. In 1990 a group of high school boys hiking in the Jameson Valley reported being buzzed by silver, spherical ball with small spike projections about 40 centimeters in width. It made fast, erratic movements above them, then hovered nine feet above the track ahead of them before shooting off over the trees. This area has often been the site of UFO encounters. In 1977 a group of seven young men on a camping trip heard a loud, throbbing noise that seemed to be coming from the earth beneath them. As it increased the earth seemed to vibrate and the boys tried to find its source. Failing that, they tried to sleep, but the throbbing continued most of the night. The next day they could find no explanation for the noise or vibration.